when I was your age” stories. with a hickory stick or a stern look. and Granny gives me her Irish grin. Something soft but fierce about her. home and things done right. Light shimmering through the room. disappears, even as it waves goodbye. Absolutely beautiful, Tosha! And what an amazing reflection of my own experiences when I was little with my Granny. Sitting on the back porch in front of that big box fan grandpa built out of the old attic fan. Sucking on coolaid icecubes she used to make for us in one of those old metal ice trays…and helping her with the green beans. Thanks for writing this. brought back good memories for me. Your love for them is well illustrated in this beautiful piece. I can you love your grandparents, too. Thanks for sharing a little about your experiences with me. My grandparents practically raised me as well. I think of them every day even as they departed this world some time ago. Beautiful words that brought a smile to my face…and a hug for my heart. Thank you. 🙂 Grandparents can be such a blessing. We do you miss them terribly when they pass on. I know you will. You are lovely. Thanks. Hope you’re having a lovely day. 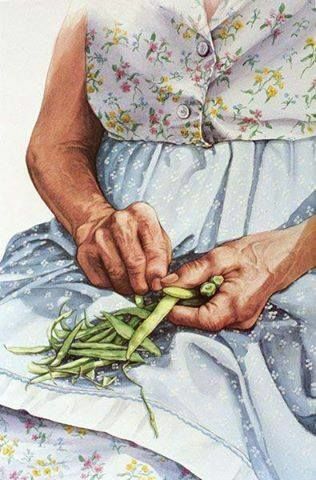 My grandmother used to snap peas and can veggies. I remember those days well. Life in the South. The next of times. You’re welcome. I’m glad she had a long, happy life. I miss my Granny, too. She left us unexpectedly, though. No great decline in her health or mind. This is a beautiful tribute, and I’m glad you shared it with us. Lots of love. Hymns hold a special place in my heart as I grew up on much of them. Well written. And thank you, my day is wonderful. I’m getting back to my roots, finally. I hope yours is just as lovely and productive. Whew. I’m glad I made the cut. My day is going well. Just fighting off a headache. Meh. I’m guessing it’s all the reading and writing you’ve been doing. . .
That and stressing over the holidays, an upcoming move, and a life if transition. I’m willing to bet you’ll make it through it. Love the poem, granny’s are the best! Thank you. That they are. This is so beautiful, and I know that atmosphere well also. I had two very wonderful southern grandmothers that raised me also. I know all about green beans, cobblers, sweet tea and picking blackberries and there is something so comforting about going back there in my mind. I also write quite a bit about my grandmothers. L. T. Garvin is a pen name and a combination of my both my grandmother’s names: Lola Twilla Garvin. Thank you so much for sharing that poem. I knew you were from my tribe. 😉 I love that your pen name is a tribute to your grandmothers. That’s really lovely. Yes indeed, it is a wonderful tribe, I think 🙂 Thank you, I do enjoy the name combination. Very nice poem Tosha…. Hey guess what I actually read it and I enjoyed it..! I like reading your content… Mind you all of this is in correlation to what jacobemet said about putting his blog on private and yadda dee da… hey remember how i said something similar once about nobody really caring what others are posting as long as eyes are getting to their content..? guess he sort of feels the same way… anyways great poem… my grandmother is not doing so well these days and i feel especially drawn to this piece that you shared so thank you. I’m sorry to read this about your grandmother. I’ll keep her in my prayers.. I hope she gets better. Here’s my thoughts on likes and what not. First and foremost, write for yourself. I do. This is my therapy. If someone does take the time to read and it strikes a chord.. terrific. If they’re just liking to like… so be it.. I honestly try and take time each day to read blogs. There’s some amazing talent here. I’m voracious and fast reader. It’s no great sacrifice.. I’m also a fan of kindness. If someone is seemingly, emphasis on seemingly, taking the time to read my blog, I feel compelled to return the favor. Some days, I have more time than others. Some days,, I just get in one of my antisocial moods and don’t want to interact with anyone. I’m a mess. Ha! This poem makes me feel very nostalgic… I use to help my grandmother do task like this before she became ill and started losing all her strength… It also make me miss the country life…. Great Read!!! Thank you. We try to hold on to the good and leave out the rest. Now obviously I never knew your Granny, but your words paint a vivid enough picture that it’s always like I did know her. That’s the sense I get. Thank you. She was a wonderful human being. I miss her. I get that sense about her, too. I’m glad that came across. Thank you for sharing. I enjoyed reading about you grandmother…such lovely memories. Remember that the warlords do not improve your life. Don’t cry down trod human, you will have enough. Than those who tempted fate by building bigger bombs. But don’t cry down trod human, there is enough, and more. Be free causes hunger in your gut, you will have enough. And those who make themselves so rich from your efforts. By indecision followed by the warmth of an affair. You wouldn’t want to trade for cash your ability to feel.